At Lastrite Footwear we manufacture and sell quality NZ Made footwear. 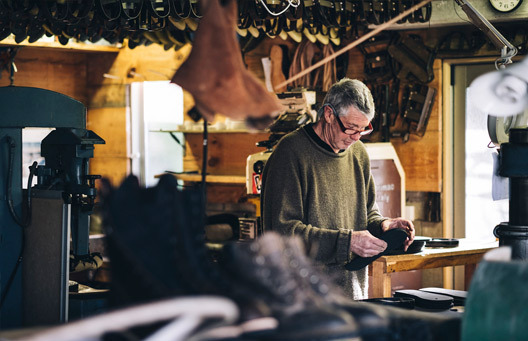 We specialise in work boots with a wide range for all work sectors, including forestry, farming, hunting, tramping and industrial boots with internal and external caps. We also make casual Jodhpur boots for men and dress wear boots in a variety of colours for women. Our unique combination of superior materials, modern technology and age old crafted methods, allows us to produce comfortable, durable and value for money. Recently Lastrite purchased The Mainland Boot Company in Christchurch and is producing Frames style boots alongside our own products. Work & Forestry External Steel Toe. We are getting more personal with our existing and new clients. \After 37 year of making 15 or so products Neville has decided he would like to be more specialised, and over the years doing field days, talking to his key clients mostly farmers. He has decided to focus more on these types of boots. He has also been developing a men's dress boot, something Kiwi blokes are not getting a well made solid leather dress boot With this move he will have more time to develop this product. Lastrite will be set up in the tractor shed, we will operating 10 months a year production time from the 1st February to early December We will still be taking orders sewing uppers but actual making will not happen between December and January. We will be open over that time to take your orders but no making until February. That will be the time accommodation and surfpad will be taking preference. Neville decided to take Lastrite footwear to Pataua North our home (surfpad) so we can actually enjoy where we live and combine both businesses so we can help each other out, Neville is not just a master hand made footwear maker with 35 years experience, but he is also a level one Surf Instructor, helping Diana his wife run a surf school, and a beach side accommodation thus the name (surfpad). Diana also works for the mobile surgical bus, along with some anaesthetic locum work in between surfing and helping with the boots. Both Nev and Di love the challenges in life and are looking forward to running their combined business together. While enjoying their surroundings, something Neville has not had much time for, with the long drives to the Whangarei work shop and retail outlet. Don't get us wrong, it has been a great journey; this is not retirement, far from it. Just more time to develop and make some improvements. We look forward to continuing business with all our loyal customers and any new ones that want a well made to measure boot to suit whatever their life style. Lastrite at Surfpad, will be open to customers who wish to drive the 35 K out to Patuau North for a personal fit. All our records from previous boots made will be kept on file for products of the farmer, yardmates, Hunter, jodhpurs some Loggers. Things will continue just the same but at present selected boots only. Look forward to continuing to making your footwear.